Crews was born in Flint, Michigan, the son of Terry Crews, Sr. and Patricia Crews. Crews grew up in a rather strict Christian household where which the rearing of the children was mainly held down by his mother. He attended The Flint Academy and earned an Art Excellence Scholarship to attend the Interlochen Center for the Arts and then Western Michigan University. While completing his studies as an Art major, Crews was a key member of the WMU football team, where he earned all-conference honors as a defensive end. Crews was drafted by the Los Angeles Rams of the NFL in the 11th round of the 1991 NFL Draft. He carved out a career spanning seven years, including stints with the Rams, San Diego Chargers, the Washington Redskins and the Philadelphia Eagles. After retiring from the NFL in 1997, Crews pursued an acting career and took a stint as T-Money on “Battle Dome” (modeled after “American Gladiators”). Crews played the beefcake “he-man” in films such as “White Chicks.” He played Damon Pearly in “Friday After Next,” starring Ice Cube and Mike Epps. He has also done commercials with Nike and Old Spice. He starred in the sitcom “Everybody Hates Chris” as Julius Rock, and his more modern movie appearances were alongside Adam Sandler in “The Longest Yard,” “Click,” and “The Benchwarmers” (as well as the long-delayed Mike Judge film “Idiocracy,” where Crews played President Dwayne Elizondo Mountain Dew Herbert Camacho). He has been featured in several Old Spice TV commercials for their “Odor Blocker Body Wash,” their body sprays, as well as their shaving lotion. In the sitcom “Are We There Yet?” Crews had a lead role as Nick Kingston-Persons. In the series’ first trailer, Ice Cube said that Crews is the perfect person to replace him as Nick, and that his physical comedy is undeniable. The series was picked up for 90 new episodes by August 2010, while Crews enjoyed box office success in three movies in August 2010 (“Middle Men,” “The Expendables,” “Lottery Ticket”). He also starred in his own reality series on BET entitled “The Family Crews,” which was about his everyday life with his family. The show premiered in February 2010 and ran through 2012. In 2012, it was announced that he would be joining the cast of the Aaron Sorkin-helmed drama “The Newsroom.” He portrayed the bodyguard and life coach of Will McAvoy, the show’s protagonist. Terry was recently a contestant in the NBC celebrity reality competition series “Stars Earn Stripes.” He reprised his role in “The Expendables 2″ and also appeared in “Scary Movie 5.” Crews is set to star in the upcoming FOX series “Brooklyn Nine-Nine,” a single-camera ensemble comedy about what happens when a detective who doesn’t take anything seriously gets a new ‘by-the-book” boss who wants him to grow up and respect the badge. Do you want to hire Terry Crews? Directly request a quote. 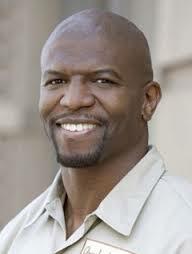 In 48 hours we can send you the availability of Terry Crews If you would like to book Terry Crews, Entertainment Booking Agency is the right place. We will offer you the best price and contact the management or we directly contact Terry Crews. For corporate appearances or speaking engagements you can contact our agents and the will help you true the process. Tags: hire Terry Crews, Terry Crews booking, book Terry Crews, Terry Crews appearances, find more information on booking Terry Crews for appearances, Terry Crews speaking engagements, Terry Crews endorsements/spokesperson, Terry Crews appearance fees, Terry Crews booking agency contact info, biography of Terry Crews, Contact an artist booking talent agent find a speakers bureau that can book Terry Crews, speaker booking agency for Terry Crews, Terry Crews booking agency, Terry Crews booking for corporate event. EBA is one of the biggest entertainment booking agencies in the World. We book hundreds of celebrities, artist, athletes and speakers in a year. Important to know is that we are not claiming to be the management of Terry Crews. We are not the official agent for Terry Crews. Companies from around the globe book these artists and speakers true our company be course we have one of the biggest networks and we always have direct contact with the artist or the management. We help you to find the right celebrities for your corporate of private events. Please contact one of our agents to get free advice and we will help to get the world-famous artist on your party.